A British-American citizen of Italian heritage, Alexia is an author, writing consultant and editor. She also teaches English Literature and Writing. Alexia did her A-Levels at Uxbridge FE (now Uxbridge Academy). One of her home libraries as a child was Oak Farm, Hillingdon. She regularly donates events to libraries across Hillingdon and South Bucks. After an MA in Social & Political Sciences (Psychology major) then MPhil in Educational Psychology & Technology, both at Cambridge University, she took a break from academia and moved to New York. There she worked on a Tony-award-winning Broadway show before returning to England to complete a PhD and teaching qualification to become a Fellow of the Higher Education Academy. In between, she worked as a West End script-critic, box-office manager for a music festival and executive editor of a human rights journal. Her debut novel, The Bone Dragon, was shortlisted for the Waterstone’s Children’s Book Prize and the Jugendliteraturpreis, and long-listed for the Branford Boase Award. It was also a Book of the Year for the Financial Times and Independent. 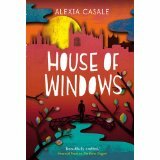 Her second book, House of Windows is a ‘Reading Well for Young People: Shelf-help‘ title. Alexia is represented by Claire Wilson at RCW. Chat to Alexia on Twitter at @AlexiaCasale or via her websites: www.alexiacasale.co.uk and www.thebonedragon.com. Evie’s shattered ribs have been a secret for the last four years. Now she has found the strength to tell her adoptive parents, and the physical traces of her past are fixed – the only remaining signs a scar on her side and a fragment of bone taken home from the hospital, which her uncle Ben helps her to carve into a dragon as a sign of her strength. Soon this ivory talisman begins to come to life at night, offering wisdom and encouragement in roaming dreams of smoke and moonlight that come to feel ever more real. As Evie grows stronger there remains one problem her new parents can’t fix for her: a revenge that must be taken. And it seems that the Dragon is the one to take it. This subtly unsettling novel is told from the viewpoint of a fourteen-year-old girl damaged by a past she can’t talk about, in a hypnotic narrative that, while giving increasing insight, also becomes increasingly unreliable. 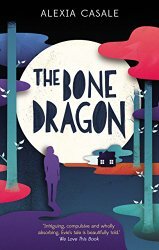 A blend of psychological thriller and fairy tale, The Bone Dragon explores the fragile boundaries between real life and fantasy, and the darkest corners of the human mind.